Because so many functions cause fatigue, and fatigue can make it even more difficult to catch a deep breath, it’s crucial to know limitations and work to keep muscles strong, as well as to take precautions against infection. With the damage done to the body of a patient with multiple sclerosis, the symptoms sometimes seem endless, and the combination of symptoms that can come about are certainly almost infinite. Each patient has a different experience with their disease, and that means they should be prepared for any of the many symptoms to arise at any time during their journey with the disease. One particular symptom that tends to get overlooked despite its prevalence in multiple sclerosis patients is the group of breathing problems that arise with the disease. 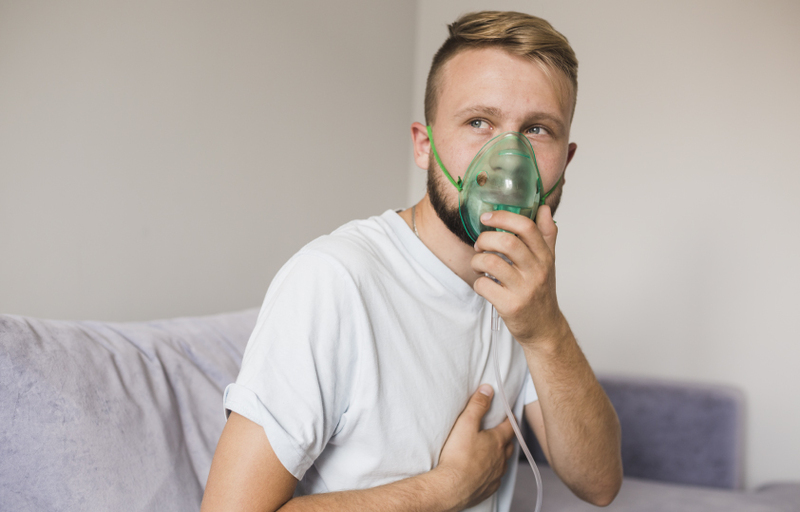 However, these can be some of the most disturbing and troublesome symptoms related to MS. Take a look at six things you should know about breathing problems if you have multiple sclerosis. As with most symptoms of MS, breathing problems arise based on the damage done to the nervous system. This degenerative and debilitating disease is based on an autoimmune response in which the protective coating (myelin) on the central nervous system is destroyed, leading to slowed electrical impulse and responses, as well as extensive nerve damage that can’t be repaired. This damage can lead to a world of problems that could potentially have an effect on the respiratory system and the patient’s ability to breathe normally. Muscle weakness – As with other muscles in the body, especially those used for ambulation and mobility, the muscles related to respiratory function are often weak in patients with MS. In tests that measure the air pressure, or lung capabilities, in these patients, most people with MS typically show about 60 to 70 percent of the strength of the average person without multiple sclerosis. Sensory issues – Nerves control sensation in the body, and damage to the nerves involved in respiration can lead to abnormal sensory information. This could cause the brain to misinterpret the amount of pressure in the lungs, the total airflow, and the way the chest wall and lungs move, causing difficulty in proper breathing. Effects of medication – A number of drugs prescribed in the treatment of multiple sclerosis works to negate pain and stiffness, including tranquilizers, opioids, and muscle relaxers, all of which can make breathing slower and shallower. Pneumonia – Trouble related to swallowing and control of excess mucus in MS patients can lead to what is known as silent aspiration, or inhaling food and drink without realizing it. This can lead to pneumonia and abscesses in the lungs. Scientists used to believe that breathing issues didn’t occur in MS patients until the disease was far advanced. However, studies now show that these can occur early in the diagnosis and could even point toward multiple sclerosis as a possible diagnosis. Instead, the new theory being explored is that the severity of breathing ailments as a symptom is directly related to the severity of the disease in progression and aggressiveness. For the majority of multiple sclerosis patients, breathing problems never become life-threatening. This is an extremely rare occurrence. In fact, most of the time, the symptoms related to breathing dissipate on their own with time and the end of relapses. At the same time, there can be lasting effects that cause disruption in daily life. The most common issue is severe fatigue, both from lack of oxygen and from the efforts made to get a deeper breath. In addition, patients may suffer from panic attacks when they feel they can’t get enough air, or they may have severe anxiety from the difficulty. Breathing problems related to multiple sclerosis tend to disappear on their own, though it may take a few days or even weeks to return to normal. There are ways to address the problem, though. Respiratory therapy – this is an effective method for strengthening the muscles used in breathing, which utilizes breathing exercises that also help patients cope with difficulties during relapses, as well as avoid some complications that arise when breathing problems occur. Avoid infection – a respiratory infection can significantly impair breathing in anyone, but especially cause problems in multiple sclerosis patients, who are more susceptible to infections and who suffer exacerbation of other symptoms when getting an infection. Washing hands, getting vaccinations, and assuring enough rest are crucial to keeping the respiratory system healthy. Good eating habits – chewing slowly and thoroughly prior to swallowing, avoiding talking with a full mouth and laughing hard while eating, and avoiding foods and drinks that causes swallowing issues reduces the likelihood of coughing, choking, and silent aspiration, which can lead to complications like pneumonia. Taking care of the lungs and the entire respiratory system are vital to quality of life for patients diagnosed with multiple sclerosis. Because so many functions cause fatigue, and fatigue can make it even more difficult to catch a deep breath, it’s crucial to know limitations and work to keep muscles strong, as well as to take precautions against infection. It can help to speak to the managing physician about options for treatment and ways to avoid complications. how multiple sclerosis affects the brain? What can happen when an MS attack affects the brain areas? Is it truth that multiple sclerosis is hereditary? How caffeine can prevent multiple sclerosis? Should everyone with MS need to have a test for osteoporosis? What role free radicals play in MS? Can Alemtuzumab really repair damage to brain in patients with MS?